Alciato at Glasgow: Emblem: Mutuum auxilium. Confort mutuel. Et socii haec oculis munera retribuit. Mutuat hic oculos, mutuat ille pedes. 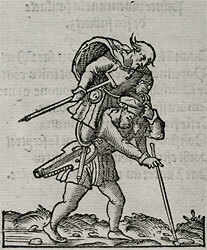 A man deprived of sight carries on his shoulders one with deformed feet and offers this service in return for the use of his companion’s eyes. So each of them by mutual consent supplies what the other lacks. One borrows eyes, the other feet. Ses deux piedz pour les yeulx prestoit. 1. This is based on Anthologia graeca 9.12. 2. In the 1536 edition, the two verses are run together as one.